Japan's space agency said Monday that its Hayabusa2 spacecraft will follow up last month's touchdown on a distant asteroid with another risky mission—dropping an explosive on the asteroid to make a crater and then collect underground samples for possible clues to the origin of the solar system. Hayabusa2 made history on Feb. 22 when it successfully touched down on the boulder-strewn asteroid and collected some surface fragments. The Japan Aerospace Exploration Agency said Hayabusa2 will drop an impactor the size of a baseball weighing 2 kilograms (4.4 pounds) on the asteroid on April 5 to collect samples from deeper underground that have not been exposed to the sun or space rays. The mission will require the spacecraft to move quickly to the other side of the asteroid so it won't get hit by flying shards from the blast, JAXA project engineer Takanao Saeki said. "It will be very challenging." While moving away, Hayabusa2 will leave a camera to capture the outcome. The spacecraft is to wait a few weeks before returning to the area above the crater for observations. The mission will allow JAXA scientists to analyze details of the crater to determine the history of the asteroid, said Koji Wada, who is in charge of the project. A day before the mission, Hayabusa2 will start descending to the asteroid from its home position of 20 kilometers (12 miles) away. It will drop a cone-shaped piece of equipment containing explosives that will blast off a copper plate on its bottom. That will turn into a ball and slam into the asteroid at 2 kilometers (1.2 miles) per second. JAXA projects it will create a crater of up to 10 meters (32 feet) in diameter with a depth of 1 meter (3.3 feet) if the underground structure is soft. A crater created on a rock-like structure would be smaller. 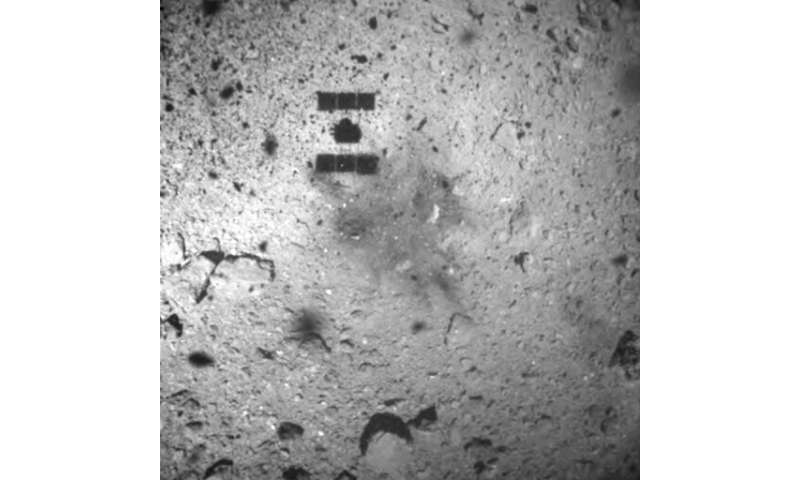 During its February touchdown, Hayabusa2 extended a sampler pipe and shot a pinball-like bullet into the asteroid surface to collect dust and tiny fragments. JAXA plans to have Hayabusa2 briefly land in the crater, but agency researcher Takashi Kubota said they may prioritize safety for the spacecraft and not do so. If it is successful, it would be the first time for a spacecraft to take materials from underground, Kubota said. Hayabusa2 is scheduled to leave the asteroid at the end of 2019 and bring surface fragments and underground samples back to Earth in late 2020 for analysis. In a 2005 "deep impact" mission to a comet, NASA observed fragments after blasting the surface but did not collect them. The asteroid, named Ryugu after an undersea palace in a Japanese folktale, is about 900 meters (3,000 feet) in diameter and about 300 million kilometers (180 million miles) from Earth. It is far away. Rather, drop dynamites DAILY on nearby Moon in INCREASING sizes, since we do not want any negative results. Once we know the maximum size of explosion that can be tolerated on moon, start bringing the soil from there. Need not be done in 1 day, 1 month, 1 year or 1 decade. Keep going and keep bringing the moon soil from various locations ! Gun Factories should rather focus on this. May not recoup their investments right away. Who knows how much gold, diamond, platinum and rare earths it has (They are all ESSENTIAL for Technology). This is basically an explosively formed projectile. One hopes they have fully characterized the copper, down to traces of other elements and to isotopic composition, so they can eliminate any of those from whatever they collect. Reminiscent of the Deep Impact mission to comet Tempel 1. They had to analyse the results spectroscopically, though. it would be funny if the impactor just bounced off the rock!